Reduction was guided by removing the large composite veneers. Covered the lingual as well due to historical tooth trauma. For e.max as in this case, the cervical feather margins were on enamel and restorations milled at 0.3 in margin zone. We can go thinner with e.max. Presence of tooth enamel is important to handle tooth support core flexing issues. Restoration(s) incisal edge remained in monolithic e.max, no cut backs. Characterized with wash pastes and glazed over to retain optimal incisal functional strength. 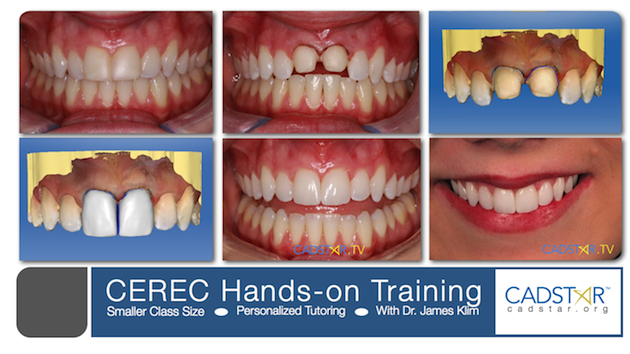 We are so blessed with the level of the current CEREC system and support materials. Dentistry is becoming more fun with each year of practice.